After a successful debut on the Canadian film festival circuit, the National Film Board documentary The Journey of Lesra Martin travels across Canada. The documentary of Lesra Martin was also screened at the Hollywood Black Film Festival. Lesra was poor, illiterate and struggling on the violent streets of Brooklyn when a chance encounter with a group of Canadians shattered the confines of his life. Pulled from the chaos of the inner city and given a fresh start in Canada, Lesra became a hero when he helped to bring justice to wrongfully imprisoned American boxer Rubin “Hurricane” Carter. Finding the courage to change his own life, today Lesra is a lawyer and motivational speaker on the world stage. 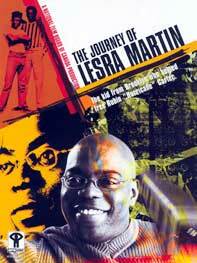 Written and directed by Cheryl Foggo, The Journey of Lesra Martin brings together intimate interviews with Lesra, his family and friends. From his home in British Columbia to a poignant return to the streets of his childhood, Lesra reflects with humour and grace on the events that altered his life. He also grieves for family still consumed by the unforgiving ghetto, while inspiring viewers to find their own strength in adversity. You work now as a lawyer and motivational speaker. What message would you like to transmit through this film? I hope that this film will leave people with message of hope. That despite hurdles and difficulties, it’s important to keep battling. We can’t determine the hand we get dealt, but I’ve come to believe that every hand can be a winning hand. And it’s important to play it out until the end. Not fold or give up. The world is not fair. It can be mean and cruel, but it is also a world where some people will give you a chance. Like the Canadians who gave me a chance. There are people who care, lawyers who care. And there are millions of Lesras who have not been as fortunate as me, let’s remember that. How did it feel the first time you saw the finished film? To see your own life portrayed in such a public way? I saw the finished film for the first time at the Vancouver Film Festival. I had spoken to the crowd beforehand, and I was sitting there, completely taken in by the film on the screen. It was very emotional and it was hard to maintain my composure. Millions of thoughts went through my head, and it wasn’t easy. I was sharing things that I had not shared before. In real life, we can’t always reflect on the past, but here it was, right in front of me, and I could not avoid it. The saving grace was being able to introduce my family — my sisters and brothers, my grandmother. Were it not for them, had they not been there to shelter me, I would not be here today. I had a chance to thank them and that felt good.